Is milk a muscle-building manna from heaven, as some claim, or a hindrance to physique and performance goals. Read on for the last word on milk and bodybuilding. In the ever-evolving physique and performance-nutrition landscape, concepts rise fast and disappear even faster. New fads come frequently but only a few last for a significant duration and reach the consensus of mainstream diet and nutrition. The advantages of low-carbohydrate diets. The health benefits of omega-3 fish oil. Why everyone should eat vegetables and fruit daily. Still undecided, it seems, is the issue of whether milk is muscle-building manna from heaven, as some claim, or a hindrance to physique and performance goals. So what exactly is that white stuff forming moustaches on celebs? Primarily made up of the carbohydrate lactose, milk is a disaccharide consisting of the simple sugars glucose and galactose. Not surprisingly, physique-minded folks initially fell in love with milk because of the handsome protein and fat content. A glass of milk contains all 8 of the essential amino acids needed for growth, recovery, and repair following an intense workout. There was even a recent uproar online after a study examined chocolate milk and found it to be more beneficial than protein powders post workout (1). We'll come back to that later, as it's far from the truth. But you can see why hard-training individuals have a crush on milk. When you look at the fat content, you'll see that two thirds of the fat contained in milk is saturated, which has been linked to potentially beneficial increases in hormones (2,3). So we have a drink that is high protein and can help make me bigger and leaner. I'm sold! When it comes to determining if milk should be included on a fat-loss diet, most coaches, trainers, or nutritionists will look at the macronutrient breakdown on the side of the carton. 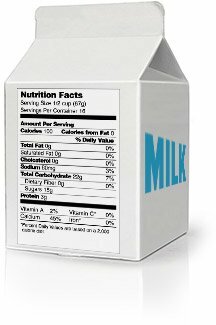 With the typical recommendation of skim milk, we find that an 8-ounce glass of milk contains no fat, 12 grams of carbs, and 8 grams of protein. "As long as it fits into your daily macronutrient goals" is a frequently seen quote on the message boards, meaning the source doesn't matter. The popular theory is that you should just count your total amount of carbs for the day, and that no food source is off limits. In this case, you'd be advised to consume milk because it only contains 12 carb grams. This is a perfect example of the analogy of not seeing the forest through the trees. The major issue concerning dieters and milk consumption is lactose intolerance. The "I don't feel so good after I ate that" feeling. You're bloated, fatigued, and all of a sudden, you feel down right nasty. We've already established that lactose is the major source of carbs in milk. All babies can digest it, but as we age, we can tend to lose the lactose enzyme that lines our intestine during our infancy. This process progresses as we age (4,5). Drink a glass of milk and take notes on how you feel. A day later, have some cheese and yogurt and take notes on how you feel again. Notice a difference? It's not a dairy issue, as some proclaim. Rather it's a fermentation issue. 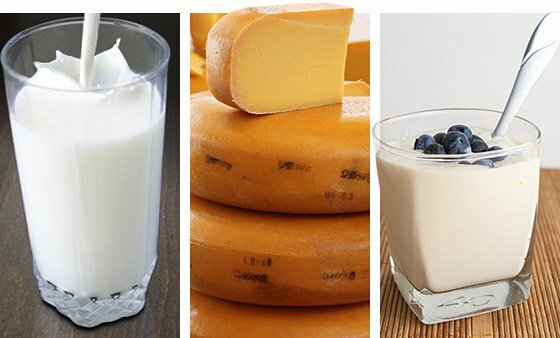 The fermentation process that occurs with yogurt and cheese breaks down the lactose but good luck finding fermented milk. Few drink it. "The fermentation process that occurs with yogurt and cheese breaks down the lactose but good luck finding fermented milk. Few drink it." I don't want to get too in-depth with organic chemistry, but food laws dictate that all milk must be pasteurized to be safe. Yes, that means that selling and buying raw milk is illegal in most states. The heat process that is involved with pasteurizing milk denatures the protein. Any diary scientist will tell you that. Remember the study above about milk being better than protein powder for the post-workout period? Wrong! I'm fully aware that whey comes from milk, but milk production and whey processing are two completely different processes. So we're dieting and training hard to lean out. Does it really make sense to include something into your diet that can make you bloated, fatigued, and wreck havoc in your GI tract, further blocking your progress by increasing the muscle-wasting, lower-ab-fat-storing hormone cortisol (6)? That doesn't sound too appealing to me. The one caveat being the option of organic, grass-fed milk. In clients, I see this being far less problematic than other options. It's a healthier version, higher in omega-3 and CLA content and is devoid of all the nasty hormones, most of which actually make their way into your milk, that regular cows are fed. So if you absolutely have to have milk then that's the option that I suggest. Karp, Jason R.; Johnston, Jeanne D.; Tecklenburg, Sandy; Mickleborough, Tim; Fly, Alyce; Stager, Joel M (2004). The Efficacy of Chocolate Milk as a Recovery Aid. Medicine & Science in Sports & Exercise. 36(5) Supplement:S126. Progress in Autoimmune Disease Research. The Autoimmune Disease Coordinating Committee Report to Congress. U.S. Department of Health and Human Services, National Institutes of Health, National Institute of Allergy and Infectious Diseases. Bethesda (MD), 2005.